Defiance! I’m sure you’ve heard of it. If not, in the real world Defiance is a cross platform, cross media, MMOFPS by Trion Worlds and the SyFy Channel. In their world? Defiance is the town that the television show of the same name is based in. It’s the name of a battle, a movement, a place and probably more besides. Suffice to say, it gets around. 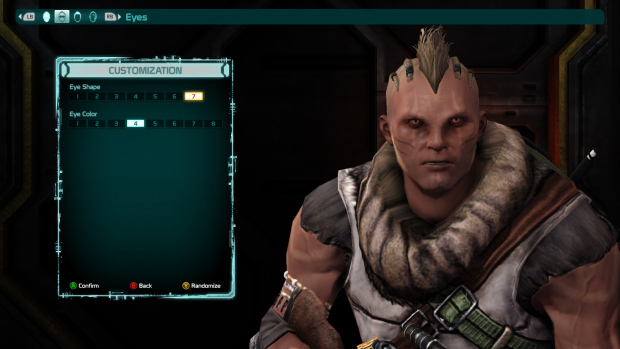 Seeing as Defiance revels in the name trans media for being both a television show and a game, we’re going to have a trans-review. We’ll do the review bit first and the opinion afterwards. Defiance is in a word fun. In several words, as stated it is a massively multi-player shooter but unlike the others on offer in the genre, it’s mostly PvE. It’s not all shooting mobs though, Defiance comes equipped with team based PvP instances for small scale action against your fellow players as well as the Shadow War system. Specifically Shadow War is an area of the open world that people are entirely able to pass through but also serves as the battle ground “training” for larger teams of up to 64 on a side. On the PvE side of things you have plenty of things to shake your weapons at. Arkfalls, which if you are familiar with RIFT, well… they’re rifts. Rocks fall, things happen, bring ammo and friends for fun and loot. Time trial races on your vehicles, leader board toting mayhem instances and other such diversions. 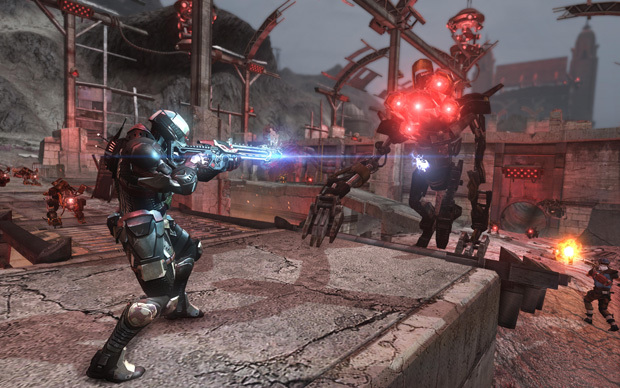 If Defiance lacks anything, it certainly does not lack diversions to keep the player busy in the post-apocalypse. Getting into the game is easy and compared to some of the character and class creators out there, rather simple and quick. Some of that can probably be laid at the feet of also making the game for the Xbox 360 and Playstation 3 crowds. At the moment there are two races which come in the male and female flavors (hey, aliens, you have to check that sort of thing). “Classes” for want of a better word really just define your starting gear and outfit. If you’re unhappy with the machinists’ semi auto rifle or the scavengers’ sniper rifle, don’t worry. You won’t go long without finding or being able to buy replacement weapons. People are guided quickly though the tutorial getting their grenades, weapons and trying out the EGO powers as they go. Coming into the game proper players find themselves very quickly getting their first ride and ego points for passive perks to apply. 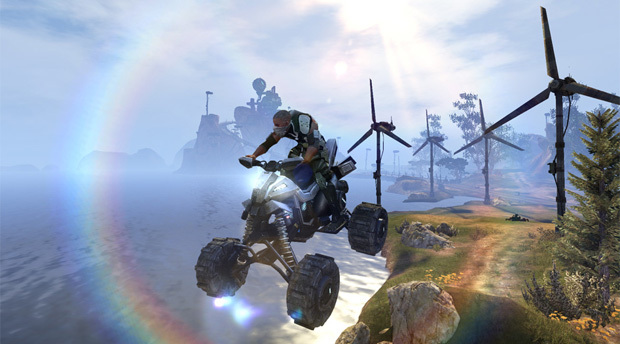 There’ll be no long foot slogs for new players; you’ll be on the little ATV fairly quickly, with various other four wheeled weapons (hey you can run things over) eventually being offered. There’s very little lead time between starting your character and getting into what Defiance is offering you. Episode missions, arkfalls, mutant uprisings. They all beckon. Moving away from the PC there are two major things to remember about Defiance. 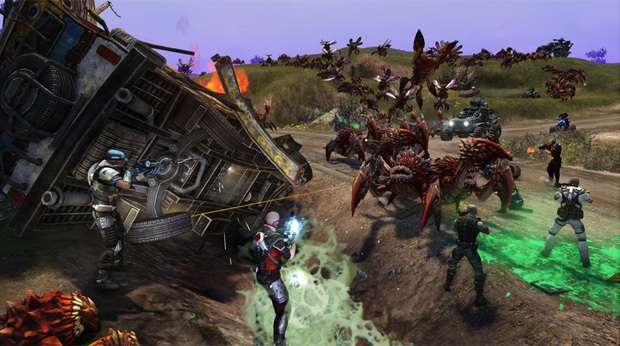 Firstly it is cross platform with the PC, Xbox 360 and Playstation 3 all being able to play Defiance. Sadly though not together. I am sure there are various reasons for it. Concessions have been made as a result with design to give the best experience across all three platforms. Would I prefer if I could hop into a Shadow War against a bunch of my friends who only have consoles? Of course I would, but if it isn’t to be, then we’ll survive. Secondly, there’s that whole TV show thing happening. While initially the amount of bleed over from the game to the show and back is limited, it is an additional influence in the game world that should be considered. Building, presumably, on the show and on the episodic idea, Defiance offers season passes to its DLC that is set to come this year. Five separate DLCs are planned and will have both free to play and paid components in them. How they will affect one another as time goes on? Well…. that’s the big question and the grand experiment isn’t it? Time and Nielsen ratings will tell. From a purely review standpoint, Defiance is well worth a look. If nothing else the trans media effort will certainly make it a touch different to anything offered on the market as you know it. Everyone I know who plays is having a great time and complaints that I personally have seen are few enough and usually attributed to the normal growing pains any game has. Any of the larger complaints have been met head on by the Defiance website with frank and clear discussion on what they are doing with regards to lag and other such irritations. From my inevitable opinion standpoint, how do you review half a product? I do not mean that Defiance is unfinished. I mean that it is only half of the story. Any other game before launch and indeed through various quests or missions will flesh out its own lore, it’s own background and personality. Defiance doesn’t, or at least doesn’t to the same degree. 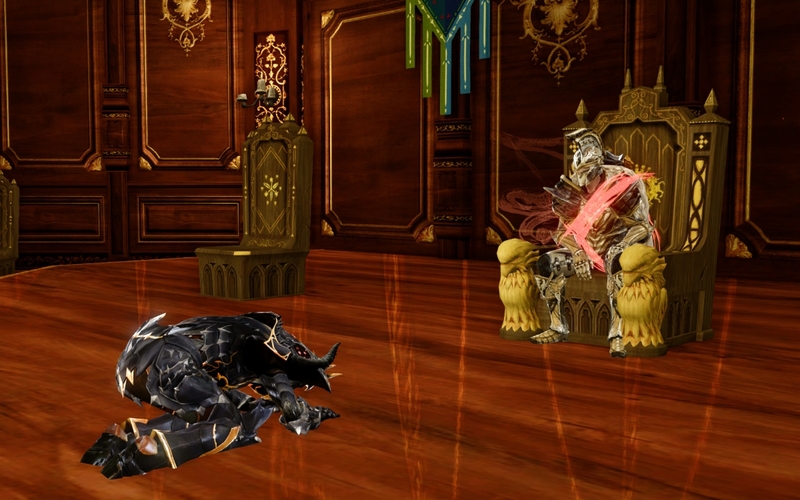 Yes I’ve read everything I have come across in-game and listened slavishly to the audio logs I have found, but I am left lacking context and at times connection. Take Nolan from the show whom we meet in Defiance early on. That should be a big thing right? However at this point I feel it’s more of an intrusion. Go away Mr. TV Character, you’ve not yet in my experience explained yourself or indeed really been much of anything to me. I’ll stick with Cass Ducar, who is cuter anyway. Why do I feel that way? Television. The characters of the show and indeed the history of the world have both been laid out on various wikis and interviews and whatnot around the Internet. However the actual emotional side, seeing the Pale Wars in full swing, watching the battle of Defiance, all of this is likely reserved for the TV show or is in areas of the game that I simply haven’t reached yet. TV demands ratings, ratings demand people to watch and so in my mind the juiciest bits of the back story and the world have been kept for that. Gamers will happily head shot things from now until the end of time, they will be entertained or they won’t. Television viewers are treated as different creatures, despite obviously the hope that people will both watch the show and play the game. So on the purely review standpoint, if you’re looking for a new game and want to storm mutant strongholds or mow down giant critters with a mob of people or simply a few fine friends, get Defiance. On the opinion standpoint, I’m still waiting for the show so I can connect with the universe. I also cannot wait to see how this whole trans media experiment goes and what it will mean for games and television in the future. My personal suggestion? Give them both a go, there may never be anything quite like this again. 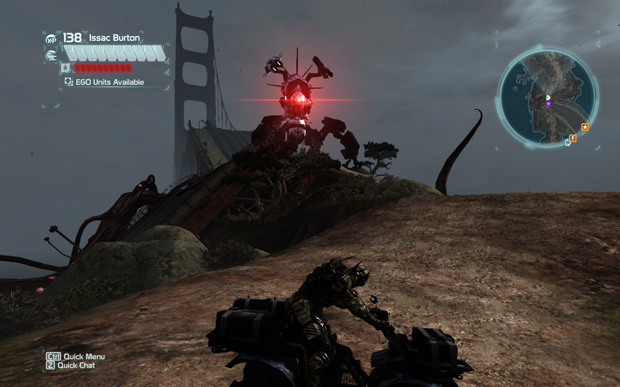 In conclusion, if you join Defiance, you’ll probably find me lurking down near the Golden Gate bridge, eying my nemesis, the giant missile spamming murder bot.